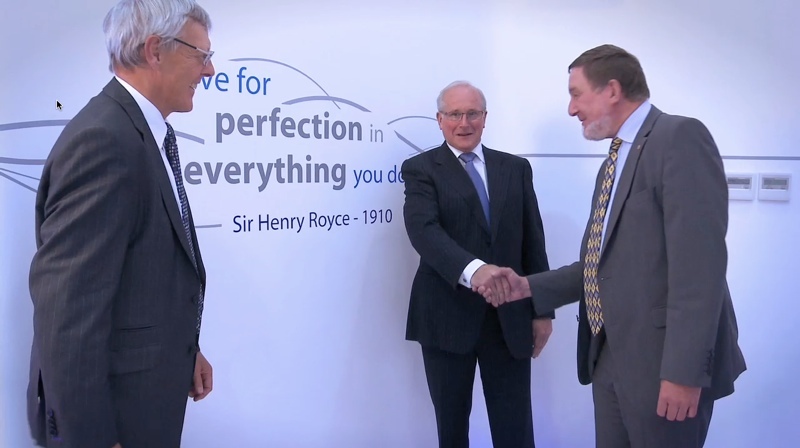 60 second profile of Professor Richard Parker, Dr Mike Howse and Professor Philip Ruffles from Rolls-Royce plc, winners of the 2011 Glazebrook Medal awarded by the Institute of Physics for the creation, development and expansion of the Rolls-Royce University Technology Centre (UTC) network, widely held to be the exemplary model for interaction between universities and industry. Professor Richard J Parker: We’ve built a network today of 28 university technology centres worldwide. It’s important to engage universities because they bring a freshness to our research. Dr Mike Howse: We have a process of trying to work out what products we will need and what technology we will need in order to satisfy the customer. The university technology centres are absolutely key in getting on the shelf he technology we need for those future challenges. Professor Philip C Ruffles: We did an audit and something like 70 per cent of the information that had been transferred to Rolls-Royce had been used either in products or in design processes. The value that was contributed was far greater than the cost that we had invested in the centres. Professor Richard J Parker: Rolls-Royce has a very strong brand an in chosing a UTC we look at world-class universities and even within those universities look for world-class researchers and professors who have high esteem in the academic world.